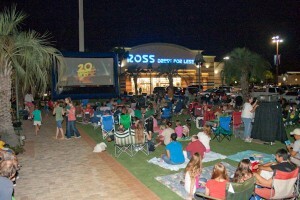 Come and re-live the Old Time Drive-In Movie experience at Uptown Station’s Central Park! Every two weeks, through the summer, we show movies on Saturday night in Central Park. Usually we also show at least one movie per month during the winter too! We have the Emerald Coast’s only giant 30′ inflatable movie screen, which we put up in front of the Flag Pole in Central Park. We have a great sound system, and in some movies you can feel the ground vibrate! Folks bring their lawn chairs and blankets and spread out on the grass at Central Park to enjoy a wide range of family friendly movies. You can also sit in your car and listen to the soundtrack on FM 106.9. There are always concession stands with drink and snacks, just as you’d expect. Plus of course, we have all the dining experiences at Uptown Station. Wine World Outlet open late on Movie Night and have a special selection for movie audiences, with cheeses snacks and non-glass containers. Details of the upcoming movies are published on this website, in Upcoming Events, and the Events Calendar. You can also join us on Facebook and Twitter so you’ll get updates and reminders. Check the calendar and Movie Nights info for details of show times, movie trailers and synopsis of the movies. We’re always open to suggestions for what movies to show, so please send us your suggestions. Most importantly, Movie Nights at Uptown Station are FREE! In some cases of bad weather, we have to cancel the movie but we post updates on this site and we send out information on Facebook and Twitter. The only things we don’t have at Movie Night are pets and glass containers, so please help us with that. If you’d like to rent Central Park and the movie screen for your own showing, or are interested in renting the screen, projectors and crew for your own showing away from Uptown Station, contact us at UptownStationFWB@gmail.com or call 850-301-0757. How about Sound of Music, Grease, ET, Wall-E, Star Wars, or The Little Rascals. When and what day or night and what time will you be showing Grease,sound of music,little rascals? We’ll put those on the list of movies you’d like to see, and if we get votes for them, we’ll either fit them into the schedule or show them at People’s Choice night in December. Question for y’all – do you like musical movies like Grease, Sound of Music, Mama Mia! etc? Would you all come out and sing along? September 26 is a Peoples Choice night. What is the show?? September 26 is a scheduled movie night and we’re showing ‘Bedtime Stories‘ . Our ‘People’s Choice’ will be December 19 and we’re going to hold a poll to see what people would like to see. The next Movie is September 12 when we’re showing ‘College Road Trip‘. Are these movie nights happening this summer (2010, and if so, are dogs (leashed) allowed to accompany their owners? Funny you should say that! However at around $18,000 each, a spare is probably not in the budget. It has only let us down once in 6 years, so we’re working on getting this fixed and seeing what other contingency plans we can put in place. We take a break from showing movies during the colder months. We plan to start movies again around April. Please watch this space for more info. i am bummed I just found out your movie night is not going tohappen when we are in town we come in on July 9 and leave july 13 any other sugesstions for us? It says that the radio station plays the soundtrack, does that mean the audio to the movie or just the musical tracks? We broadcast the whole movie on the FM radio, not just the music. will the sound also be heard threw speekers so the lawn folks can hear? It certainly will! We have a speaker system that plays around the park and also has speakers in the ground so you can ‘feel’ the noise! Will the free outdoor movies be held this summer?